Whether you need a simple repair or an entire home renovation, Homecraft® Inc. can help you transform your living space from drab to daring. We deliver the absolute best in craftsmanship, materials and products built to perform, treating you to one-on-one attention that gives you peace of mind every time. We are dependable, reliable, dedicated and friendly. Choose us for siding, window replacement, doors, gutters, and roofing. 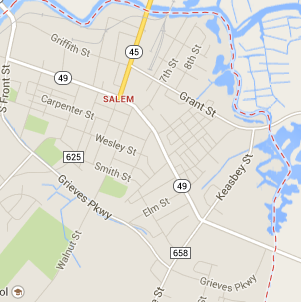 We are your #1 company for home improvement services in Salem NJ, situated in Salem County. With a population of 5,000, this small town is the county seat, with its name originating from the Hebrew word meaning “peace”: shalom. With our windows, you get superior performance, guaranteed energy savings, and many years of service you can count on, thanks to the broadest selection and highest quality Homecraft® vinyl replacement windows, or Andersen® wood replacement windows. From entry and storm doors to patio and garage doors, Homecraft can help you impress your guests with a beautifully crafted entry door. It’s time to increase the convenience of your home with an automatic garage door, and protect your home against all seasons with weather-resistant storm doors in Salem NJ. Our cedar shake siding or vinyl siding in this small hamlet will brave the elements and the test of time. We give you several choices, such as the traditional look of cedar shake siding to match the look and décor of your existing, or quality vinyl siding for a beautiful new look with no maintenance required. As a key structural system in your home, your roof must protect your house from all types of weather. Find out why so many of your neighbors trust Homecraft® Inc. for roof repairs and new roofing around. We are GAF MasterElite™ roofing contractors, offering you the country’s highest quality roofing systems, backed by the industry-leading “Golden Pledge™” warranty protection. A great roof must be accompanied by great gutters in order to do its job. Salem NJ homeowners have come to count on Homecraft® Inc. for gutter systems that are built to handle anything Mother Nature can throw at it: rain, snow, or ice, all while efficiently managing the flow of water off your roof and away from your home. We strive to deliver on promises of 100 percent customer satisfaction as part of our home improvement services. We can replace worn parts and repair damage or put on additions: whatever you need. Protect your home thanks to the skill of our experienced team of professionals that only installs the highest quality products possible here at Homecraft® Inc.
FREE Estimates on Salem NJ Home Improvement, Windows, Doors, Siding or Roofing. Call Homecraft®, Inc., today at 1-877-494-0377 to schedule a FREE in-home consultation and estimate for your Salem NJ home improvement project, roofing, siding, replacement windows, doors, or gutters.